NEWARK, Ohio (CNS) — For Tonya and Chuck Cooper, family isn’t just those who share their last name. When it comes to helping people in need, the couple often sets an extra plate at the dinner table for someone without food, offers a night’s rest to someone without a bed or readily provides a lift to the doctor’s office for a neighbor whose car broke down. “We share a community. We share a town,” Chuck told Catholic News Service in late December. Life became more of a struggle though for the Coopers as 2017 dawned. 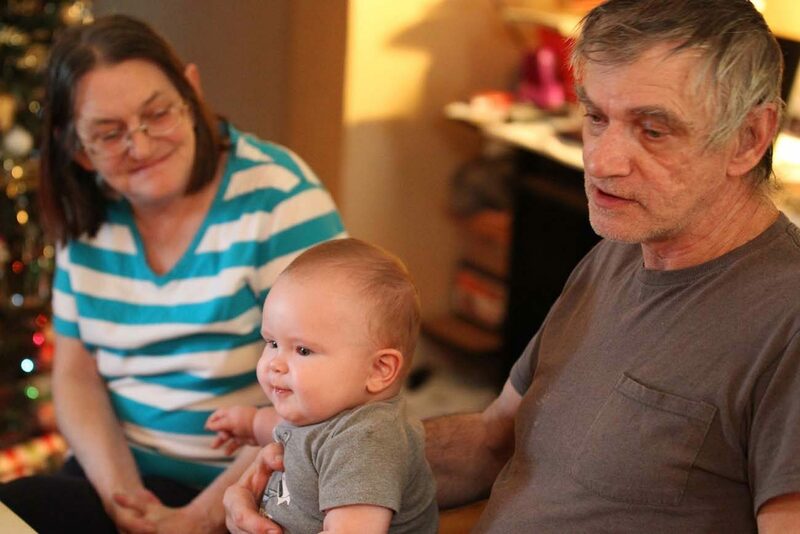 Chuck, 59, lost his job in the fall at a mail marketing company down the road in Hebron that paid $9.59 an hour, because he needed surgery on both of his knees and received no guarantee he could return once fully recovered. He had one surgery in November and is doing well. A second surgery is set for early 2017. During his three years on the job, Chuck had no health insurance, however. His share of the cost through the company was too expensive, he says. So Medicaid is footing the bill. Tonya, 57, is unable to work because of a disability. The family’s only income is her monthly Supplemental Security Income stipend. The couple also receives a limited benefit under the Supplemental Nutrition Assistance Program, or SNAP, formerly known as food stamps. Without Chuck’s income, the Coopers have fallen two months behind on the rent. They live in a $495 a month two-bedroom, first-floor apartment in a duplex they share with their daughter Samantha, 27, and her 7-month-old son, Benjamin. Another daughter lives upstairs in a separate unit. “Are we impoverished? From my standpoint, no. But are we under the bar or the (poverty) line? Yes, we are, and we’re sinking farther under it as we go,” Chuck says. Situations like that facing the Coopers have become more common in places such as Newark, a formerly bustling Midwestern town of 48,000 located 35 miles east of Columbus that once earned the nickname “Little Chicago.” Since the 1980s Newark, like similar communities, has seen well-paying jobs leave town. In 2015, the city’s poverty rate stood at 23.2 percent, according to U.S. Census Bureau statistics. In response, a group of concern citizens set in motion an effort to give struggling people a voice in changing how government and nonprofit agencies respond to their needs. They envision a venue to share stories — and expertise — about how difficult it is for many families to live day-in and day-out deciding whether it’s best to pay the rent, keep the heat on, visit a doctor or feed the kids. What emerged was the Newark Think Tank on Poverty, a nonsectarian project funded in part by the U.S. bishops’ Catholic Campaign for Human Development through the Society of St. Vincent de Paul in the Columbus Diocese. It brings about 40 people together monthly to discuss workable ideas on how to shape the community’s response to people in need. The Coopers are founding members of the think tank. Tonya holds a seat on its leadership team. More than half of the leadership team are people experiencing poverty and appreciate having an opportunity to be heard especially because they have rarely been heard before, Farias explains. Another aspect of the think tank involves ensuring people that who are facing challenges from being in poverty — car repossession, eviction, lack of food — will not be forgotten or abandoned, that they will be connected with the services they need. “We are in relationship with them,” Farias said. The think tank also promotes the importance of having its members represented on committees and boards of local government and social service agencies. To the think tank’s credit, its members serve on the Licking County Jobs and Family Services Planning Board, an Adult Court Services committee and the board of the Pat and Herb Murphy St. Vincent de Paul Center. Four Newark area parishes established the center in response to the vision of accompanying people in need as expressed by Frederic Ozanam, founder of the Society of St. Vincent de Paul. After its first meetings, think tank participants settled on three issues to address: discrimination against people convicted of felonies who are attempting to rebuild their lives but have difficulty finding work; the lack of jobs that pay a living wage; and inadequate mental health and addiction recovery services. Convincing the Newark City Council to pass an ordinance that removes a question about felony convictions from city employment applications gave the think tank an early victory. Think tank leader Eric Lee applauds the move. At 60 and having spent a third of his life in prison, Lee knows the challenges of trying to find gainful employment. He told CNS that people returning to Newark after time in prison struggle to find a job because employers often are fearful of hiring someone convicted of a serious crime. Since his release Lee has graduated from college and is working on a master’s degree in management. He works side-by-side with people released from prison to help them re-enter the community and leave behind the habits that got them into trouble in the first place. The think tank can trace its roots to the work of the Society of St. Vincent de Paul in town more than two decades ago. Bill Hammond, a St. Francis de Sales Church parishioner, became involved in the society in the early 1990s and helped guide it from an organization that simply raised funds for charitable works to one that advocated for needy people. Downplaying his role, Hammond, 84, told CNS he simply followed the directives that Ozanam established in founding the Vincentians in 1833. Among the precepts was that Vincentians were to visit families in need rather than simply provide charity and move on with life. Under Hammond’s leadership, the society’s presence grew in Newark and the home visits became integral to its ministry. Hammond then became president of the society’s diocesan council. For six years, he embraced the same philosophy. “When I started reading and studying the manual and history, they emphasized that we didn’t become a Vincentian really to give the poor money. It was first of all about us getting the opportunity to grow spiritually by serving and living out our faith,” Hammond says. Hammond’s efforts made the think tank possible, said Allen Schwartz, a retired community organizer who offers his insight from years of grass-roots experience to its leadership team. “Bill’s insistence on the visits can’t be minimized as social justice work because people who don’t do social justice work objectify the needy,” Schwartz explains. “They just write the check (and say) ‘Don’t bother me.’ It’s the visits that hold back that process of objectification and created the situation where we could then take it to the next step of the think tank. “We not only need to stop objectifying these people who are in need, but we need to act on their behalf,” he says. The think tank has one staff person. Wendy Tarr is director and lead organizer of the Vincentian Ohio Action Network, which the diocesan society established. She spends part of her time in Newark identifying people who are ready to lend their voices to changing public policy. Her understanding of the Vincentian vision runs through her work as she addresses the need for society to broach the gulf that keeps poor people outside of society’s mainstream. “In order for our democracy to work and for our agencies and organizations to be meeting real needs in the community, there has to be participation and leadership from people who are not in the middle class, but from people who are in the working class and poor,” Tarr explained. The think tank helps people understand how power is structured in U.S. society and how the problems poor people in particular face are connected to ineffective social policies, she says. “People (in need) have voice and answers to problems. They have solutions and insight that are really needed in order to create a working system and create new ways in society to address poverty,” Tarr explained. The Coopers said that having a voice in decisions affecting their lives is what they seek. Chuck Cooper said he hopes the think tank can help bridge the distance between “the haves and the have-nots” in Newark. “If you’re, unfortunately, in that thin line that differentiates the two you can get lost real quick. I know. We’ve been there. We’re still there. We make too much for (public) assistance, but we don’t make enough to feel comfortable. It becomes a limbo,” he said.